"Rania visited today Al Zarqa University College and met with youth taking part in the Youth Entrepreneurship and Employability Project "Sanad", a project implemented by the Business Development Center (BDC). At one of the college's halls, Queen Rania dropped in on the ‘Know about Business’ session attended by students from different faculties and a number of graduates from the Sanad project. The Queen listened to the CEO of (BDC) Mr. Nayef Stetieh give a brief presentation about the project and its partnership with the Balqa Applied University, which serves as an umbrella for a number of university colleges in Jordan, including Al Zarqa University College. Mr. Stetieh explained that Sanad was launched last year in collaboration with the Canadian International Development Agency (CIDA) to improve the economy in Jordan by increasing employment opportunities and promoting entrepreneurship amongst youth. The program also aims to build partnerships between the private sector and community colleges across the kingdom as well as hone skills of students and graduates of vocational schools and community colleges in order to improve their employment opportunities." " Rania visited Darat Al Funun, marking the 25th anniversary of its establishment as a home for the arts and artists of Jordan and the Arab world. During the visit, Queen Rania met with a number of women from Amman; several Royal family members also attended the meeting, according to a statement released by Her Majesty’s office. Darat Al Funun is part of the Khalid Shoman Foundation and serves as its headquarters. 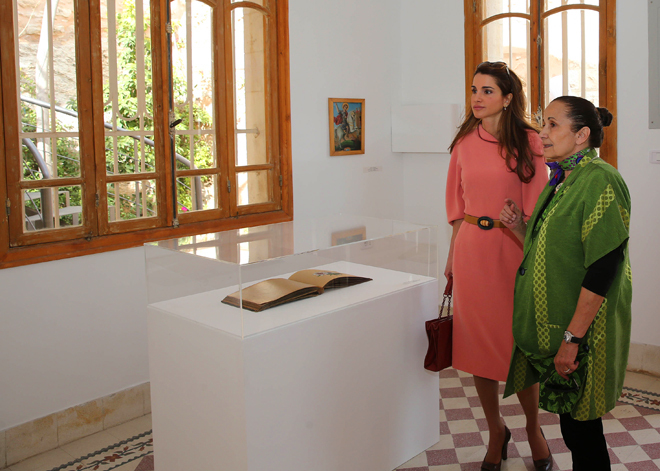 Queen Rania toured the facility accompanied by its founder and director, Suha Shoman. Shoman said Darat Al Funun is celebrating this occasion by organising a programme called “HIWAR/Conversations”. The programme brought together 14 artists from the Arab world, Africa, Asia and Latin America who were offered two-month residencies in Amman in 2013. The initiative culminated in an exhibition showcasing the artists’ work as well as pieces from the Khaled Shoman Foundation collection, the statement said. Darat Al Funun consists of six historical buildings that were restored and divided into various sections to attract talented and creative artists." Rania attended "the launch of a new partnership between the Queen Rania Teacher Academy (QRTA), the Ministry of Education, and the United States Agency for International Development (USAID). This partnership aims to strengthen the quality of education in Jordan as well as improve teachers' skills by providing them with various trainings and workshops. According to the new partnership, USAID awarded QRTA a grant of $3.2 million to implement a program called “Cultivating Inclusive and Supportive Learning Environments” in Jordanian schools. The academy will use the grant to hold trainings and build the capacity of teachers from 200 public schools in Jordan. The program’s target is to train 4000 teachers, and by doing so, the reach of the program will span to benefit more than 130,000 students across the kingdom. U.S. Ambassador Stuart E. Jones, USAID Mission Director Beth S. Paige and His Excellency Minister of Education Dr. Mohammed Thneibat also attended the event. as beautiful and elegant as usual. pity we don't see much of her,lately. "Rania on Sunday met with Germany’s First Lady Daniela Schadt who is visiting Jordan with the purpose of supporting the Kingdom’s efforts in hosting Syrian refugees and checking on the different services they are being offered. UNICEF Executive Director in Germany Christian Schneider, German Ambassador to Jordan Ralph Tarraf, UNICEF Executive Director in Jordan Rozan Charlton and UNICEF Regional Director Maria Calivis also attended the meeting. Discussions covered the services made accessible by UNICEF Jordan to the Syrian refugees through its collaboration with other governmental entities and civil society institutions, according to a statement from Her Majesty’s office. Schadt praised Jordan’s efforts in hosting Syrian refugees and extending services to them. She highlighted the vital role of international institutions in such humanitarian efforts, commending Queen Rania for her efforts in this regard, the statement said." Rania "engaged with students at the Shajaret Al Dur Elementary School for Girls in activities organised by the Madrasati initiative and the Raneen Foundation. Established in December 2009 as a Jordanian nonprofit organisation, the foundation produces audio stories for children in classical Arabic to develop their listening skills and strengthen their Arabic language, according to a statement from Her Majesty's office. The Queen was briefed on the foundation's activities and collaboration with Madrasati by its founder, Rawan Barakat. Barakat explained that the Raneen Foundation produces audiobooks recorded in a dramatic way with sound effects and music to inspire children and encourage them to use their imagination and creativity. She added that playing these stories to children helps them improve their listening, writing, speaking and acting skills. Barakat also told the Queen that the books are specifically made to help visually impaired children enjoy stories and develop their listening skills, according to the statement. Queen Rania then spoke with fifth graders who were participating in a reflection exercise after listening to one of the foundation's audio stories. The students, along with two teachers, engaged in a discussion about the morals of the story." "To show appreciation for all that they do, Her Majesty Queen Rania Al Abdullah meets with Jordanian women who made a difference in their own communities and wishes women around the world continued success on International Women’s Day. " In a blog post published on Wednesday on The Huffington Post’s Huffpost Impact, the Queen wrote that young girls who dream grow up to be “confident women who participate in their communities and countries”, “strong women who contribute to their nations’ growth and prosperity”, and compassionate women who nurture and guide the next generation. The blog post, titled “Girls who Dream Become Women with Vision,” was published as part of the UN’s “Global Moms Relay” campaign launched to exchange stories about mothers around the world who have affected their societies, with the aim of raising funds for international initiatives to provide better healthcare for mothers and children, according to the Jordan News Agency, Petra. In her article, the Queen spoke about attending a celebration of International Women’s Day, where she “had the privilege of sitting down” with a group of women with vision. “What unites these women is not motherhood — some are not mothers. And you won’t read about them in Forbes or the Financial Times. Neither are they CEOs, lawyers, financiers or doctors — careers that many see as traditional markers of success,” Her Majesty wrote. “What unites them is their strength, resilience and resourcefulness. They’re all role models. They are blazing trails,” she said. " The Bottega Veneta dress is gorgeous! Rania "joined students from the Al- Aman Fund for the Future of Orphans in a vocational training workshop, in cooperation with Al Quds College. The workshop, which was held at the college premises, discussed the outcomes of the vocational training campaign which was launched last year through the partnership of both organizations to promote vocational training amongst youth in Jordan. During the event, Queen Rania praised this partnership and stressed the importance of changing society's mindset towards vocational jobs. The Queen also highlighted the important role that the private sector plays in encouraging youth to participate in vocational training as well as partnering with training centers to ensure that graduates' skill match the demands of the current job market"
Rania "joined 120 young Jordanians from across the Kingdom in a discussion aimed at outlining the Jordan River Foundation’s (JRF) strategic youth development plan for the next five years. The discussion, which was held at the King Hussein Youth City, is the first of many activities planned for the future that will include the involvement of local institutions in both the public and the private sectors, according to a statement from Her Majesty's office. The aim of these activities is to build a comprehensive strategy for youth development that can be implemented by all constituents of the community so as to achieve the best results based on the opinions, ideas and initiatives of young Jordanians. The Queen told the participants, who are active in various programmes run by JRF, how important their opinions are due to the fact that they all face challenges and thus have a big role in identifying priorities. Her Majesty asserted the importance of their participation in the process of drawing up future plans and not just the implementation of such plans." Rania visited "the SOS Village in Irbid to be with the village mothers and children on the occasion of Mother’s Day which falls on Friday of this week. In the village, Her Majesty had the chance to meet with mothers and aunts and exchanged words with them about the roles that they play in the village relevant to the upbringing of the children. The mothers and aunts talked about the tenderness and affection they give to the children which provides them with a sense of security. They also shared with Queen Rania stories of their bonding with the children that in turn helps in creating the sense of family unity. Her Majesty praised the role of SOS village mothers and aunts on the positive impact they have had on the lives of SOS village children. Her Majesty also praised the partnership between Al-Aman Fund for Orphans and SOS villages in enabling children to achieve their goals and become pioneers in their communities." Rania held "a lunch at Basman Palace for honoring the supporters of the Madrasati Initiative which has to date included 500 public schools across Jordan in various different stages of Madrasati’s Five Phase framework. The lunch was held in recognition of all those who supported and partnered with Her Majesty’s Madrasati initiative to ensure Jordanian children receive quality education in environments fertile for creativity and excellence. It included a number of officials and CEOs of private sector companies who support the initiative as well as directors from various civil society institutions. Queen Rania thanked all contributors and supporters for their efforts and for believing in the success of Madrasati and its importance. Her Majesty referred to the achievements and successes of Madrasati as the greatest indicators of how through working together accomplishments can be solidified. Rania "visited La Storia Museum in Mount Nebo in Madaba today and took part in adding a few small stones to what aims to be the largest mosaic in the world, a project given the name the “King’s Way”. The mosaic project “King’s Way” aims to enter the Guinness World Records with the world’s largest mosaic portrait that will, when finished, span over 180 square meters. The mosaic is a visual representation of the various cities peppered along the “King’s Way”, a path that starts at the south of the Kingdom in Aqaba and which then travels North to reach its end at Bosra Sham. Work on the mosaic started in March of 2013 and has since encouraged the participation of locals and tourists to contribute to the mosaic by adding small stones to it. The mosaic will not only be the largest mosaic in the world, but the largest collaborative art-work of its scale. It is approximated that, once completed, the mosaic will comprise of 3.5 million stones. It is estimated that 1 million pieces have been placed by around 45,000 people so far. Her Majesty toured the museum which tells the story of the region represented by mechanically animated statues and models, and incorporates a mixture of religious and cultural heritage of Jordan and the region." "The situation in Syria a “political conundrum and a heartbreaking humanitarian crisis”, Her Majesty Queen Rania said on Thursday, urging the international community to step up support to refugee host communities. Speaking at the fifth annual Women in the World Summit as the featured dinner interview guest, the Queen also addressed various issues and challenges pertinent to women and education in the Arab world, according to a statement from her office.